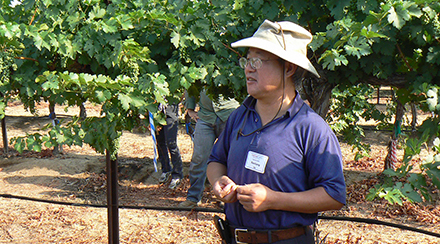 Viticulture professor Dr. Sanliang Gu of California State University, Fresno, discusses the crop forcing research trial while standing in row of Cabernet Sauvignon in the campus vineyard. Fresno, Calif.—Information gleaned from a “crop forcing” vineyard trial in Fresno shows good promise for improving winegrape quality from the San Joaquin Valley and other warm climates by managing vines to shift the grape-ripening period from hot summer months to cooler months later in the growing season. At the Aug. 14 Fresno State Grape Day presented by the California State University, Fresno, Department of Viticulture and Enology, CSUF viticulture professor Dr. Sanliang Gu provided an update about a crop-forcing trial in a Cabernet Sauvignon block of the campus vineyard. Cabernet clusters on control vines that developed under normal season conditions had completed veraison and were within two weeks of harvest. In contrast, crop forced (CF) vines in the same rows had clusters of small green berries that likely will be harvested in November. Grapes in Fresno typically ripen in July and August, when daily average low and high temperatures range from 68° to 98°F (July) and 66° to 97°F. (August). In contrast, October average temperatures range from 53° to 80°F. Gu said with CF, the flowering to veraison period is shorter, occurring during the warmer summer months. But most importantly, the ripening period is longer, with veraison to harvest shifted into the cooler months from September to November. CF takes advantage of grapevine physiology by which a vine can bear fruit more than once per year if the compound buds are forced out of dormancy. Gu has been conducting trials since 2009. (See the story “Crop Forcing Can Delay Winegrape Ripening” from August 2010.) This week, Gu reported on the successful trial outcomes regarding methods for vine management and timing of crop forcing; he also provided grape quality and chemistry data from the 2011 harvest comparing CF fruit with control fruit. In 2011, CF shifted veraison from July 25 to Sept. 26, and harvest from Sept. 1 to Nov. 18. CF fruit had smaller berries, lower pH and higher titratable acidity (TA) at veraison and at harvest compared with control fruit. CF fruit at harvest had lower Brix and pH, but higher TA and malic acid as well as higher amounts of skin anthocyanins, tannins and total phenolics than the control fruit. Gu noted that overall yields are lower for CF fruit—6-6.5 tons per acre compared to an average of 7.5 tons per acre for control fruit. He believes an average of 5-6 tons per acre would be a good range for CF fruit to achieve good quality parameters. During the first two years of trials in 2009 and 2010, a range of crop-forcing periods was studied in which vines were stripped post-bloom at intervals as short as every seven days from May through July. CF in May was still too early for significant quality improvement. Waiting until July was too late, as one year green berries were damaged by frost in early December. Gu has concluded that CF during June is the best time to achieve favorable conditions for ripening and quality. In 2011, shoots were hedged and first growth clusters were removed June 24, about six weeks post-bloom. Gu and his research crew also are working on one of the main management challenges, finding a mechanical or spray method to hedge and remove clusters for CF, so it can be economically viable in larger acreage vineyards. • It could enable expansion of winegrape production, and the planting of more cultivars, in regions considered too warm for quality winegrape production. • It could be a tool to adapt to global climate change. • It can be used to produce a crop after primary clusters are destroyed by spring frost, if the remaining growing season is long enough. • It could aid in grapevine breeding by synchronizing bloom and development periods between cultivars that grow at different seasonal rates. • It can be used in campus and teaching vineyards to enable students to see all stages of vine and fruit development at the same time, or in a short period, in the same vineyard. The biennial Fresno State Grape Day featured updates from faculty and student research projects as well as tours of department facilities including the Fresno State Winery, the wine sensory lab and the V.E. Petrucci Library that houses research and information materials available for viticulture and enology students and the wine and grape industry. Department chair Dr. Jim Kennedy updated attendees on the V&E department and program that has grown in enrollment to 200 undergraduate students. The department now has approval to begin a formal internship program with class credit to enable all students to gain industry experience by the time they graduate. “For those of you in the industry who would like to mentor students, our internship program now offers more opportunities for you to partner with our program, “Kennedy said. In spite of university-wide budget constraints, the department has received approval and is conducting searches for two new faculty positions—a winegrape viticulturist and a wine chemist. In addition, Fresno State Winery has an opening for a business and marketing specialist. Kennedy also said that the campus vineyards would begin a replanting process next year, starting with a 20-acre block. Vineyard redevelopment will provide new teaching opportunities with more winegrape varieties and a new raisin vineyard.